Value chain tutorial or guide helps you better understand value chain diagram so that you can make full use it for good purposes. Value chain is the whole series of activities that create and build value at every step. The value chain analysis describes the activities the organization performs and links them to the organizations competitive position. A value chain is a set of activities that an organization carries out to create value for its customers. The idea of the value chain is based on the process view of organizations, the idea of seeing a manufacturing or service organization as a system. Value chain analysis describes the activities within and around an organization, and relates them to an analysis of the competitive strength of the organization. How value chain activities are carried out determines costs and affects profits, therefore, drawing a good value chain is of great importance. Value chain activities can produce goods or services, and can be contained within a single geographical location or spread over wider areas. Michael Porter developed this concept in his 1980 book 'Competitive Advantage'. Porter defines the value chain as made of primary activities and support activities. Also, Porter distinguishes between primary activities and support activities. Primary activities are directly concerned with the creation or delivery of a product or service. Primary activities can be grouped into five main areas: inbound logistics, operations, outbound logistics, marketing and sales, and service. Each of these primary activities is linked to support activities which help to improve their effectiveness or efficiency. There are four main areas of support activities: procurement, technology development, human resource management, and infrastructure. The value chain describes the full range of activities that firms and workers do to bring a product from its conception to its end use and beyond. The activities that comprise a value chain can be contained within a single firm or divided among different firms. The term "Margin" implies that organizations realize a profit margin that depends on their ability to manage the linkages between all activities in the value chain. In other words, the organization is able to deliver a product / service for which the customer is willing to pay more than the sum of the costs of all activities in the value chain. 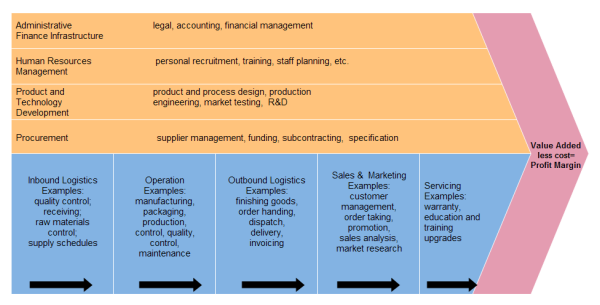 The above example is a profit value chain drawn via value chain maker. 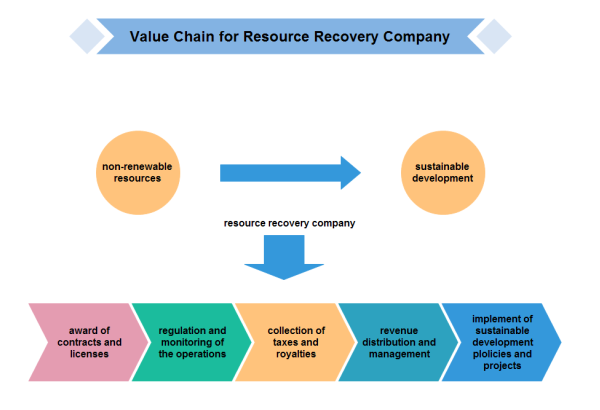 You may take a try to draw your own value chain with the help of value chain maker. Although it is quiet convenient to use value chain to understand the sources of value for an organization, it is kind of difficult to draw a value chain by hand. No worries, let me show you how to use value chain maker to quickly and correctly draw a value chain. 1. First things first, choose the value chain shape you like from the library which is on the left of the canvas. 2. Drag and drop value chain shapes you have chosen on the drawing page. 3. 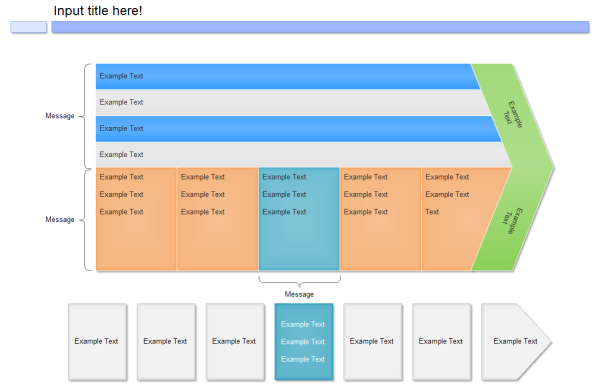 Double click the "Example Text" to edit the value chain text. You may also edit other value chain features to make it look more attractive.